Pictured from left are Lucas Weaver, Ryder Higgins, Quinn Holmes and Lora Walton, Pioneer Tech Children’s Lab Coordinator. The Pioneer Technology Center Children’s Lab & Preschool will be open year round, beginning in the summer months of 2019. This decision was made due to the ever-rising need of child care facilities in and around the Ponca City area. 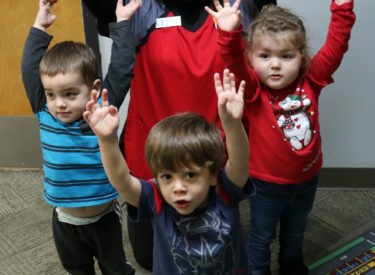 “Childcare is limited in this area and we are excited to be able to provide the expanded service hours for our community,” Lab Coordinator Lora Walton said. The staff members of the Children’s Lab have begun planning a fun and eventful summer packed full of outdoor explorations and new adventures. Age ranges include 1 year old up to 4 years old. Pioneer Tech’s Children’s Lab and Preschool is a Three Star Accredited Center through NAEYC (National Association for the Education of Young Children). The center uses the biannual assessments to guide curriculum that is not only enriching but also engaging. “We follow the Oklahoma Early Learning Guidelines which are standard for curriculum mandated by the Oklahoma State Board of Education,” Walton said. For more information and rates, contact the Pioneer Tech’s Children’s Lab and Preschool at (580) 718-4268 or visit pioneertech.edu/childrenslab.